If you're a fan of big passenger-carrying wagons, and can cope with the operating costs, SUVs don't get much bigger than a Suburban. Boat and trailer owners in particular gravitate toward Suburbans, which offer up to 8,100-pounds towing capacity (or 9,700 pounds for the two-wheel-drive 2500 series). 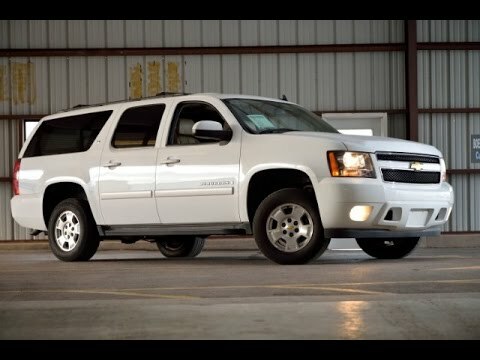 The suburban is a large capacity vehicle that is very roomy inside. The suburban is very roomy. It seats up to 8 people and has lots of head and leg room. The gas mileage is not the greatest, but it is a very dependable car. It has a rear camera and a DVD player. It has both v6 and v8 engines, and shifts between the two automatically. The seats are leather and both the front seats and middle seats are heated. There is a sunroof and a center console, along with cup holders for every passenger. The trunk opens up with a touch of your hand or with the remote. It is a heavy duty steel blue tank, it is my lifeline to the world. I enjoy the large size of the suburban, it has 4-wheel drive and handles great in the snow, it can pull a large trailer easily when we go camping. Has plenty of room for my large family and our extra stuff. It can also be great to just camp in with 2 people because the seats fold down. My kids can bring their friends on trips, it has room to provide extra seats for school trips. It can carry large items when I go shopping. My suburban is a sturdy, I would recommend this vehicle to anyone. My suburban gets good fuel mileage, the engine size of this vehicle is heavy enough to pull trailers with moderate loads, interior is suitable for several passengers. Second row of seats has two buckets seats which give easy access to 3rd row seating. Large cargo space behind 3rd row is adequate for shopping needs. Entertainment of DVD system is nice for passengers. Has a nice GPS tracking system with large screen to see.